I love to go to bookstores and I can stay the whole day there. I am not a book lover but I am very much interested in other things book store offers --- Craft Stuff. When I was still working in Singapore (3 years ago), Popular Bookstore in a neighborhood mall, was my favorite place to visit. I was a regular customer (even in other branches), and I am very much excited when they have a SALE, things are really affordable. Looking for interesting things in the bookstore, I came across this little plastic with some little square colorful fabric inside, a needle and threads. It looked interesting. The cover inside shows a cute animal with illustrated directions on how to sew. Can't resist on the cuteness of the animals, I bought all the designs, it was only SGD $1.00 each. I read through the instructions and then I came to know that the fabric is called FELT. Googled FELT, looked at FELT projects and then I fell in love with FELT!!!! Sewing these cuties was not as easy as the illustrations. Patiently, I managed to finish! I first posted these photos in my Friendster and Multiply site before and got good comments. It urged me to do more projects and collect more and more FELT (plain and printed)!!! 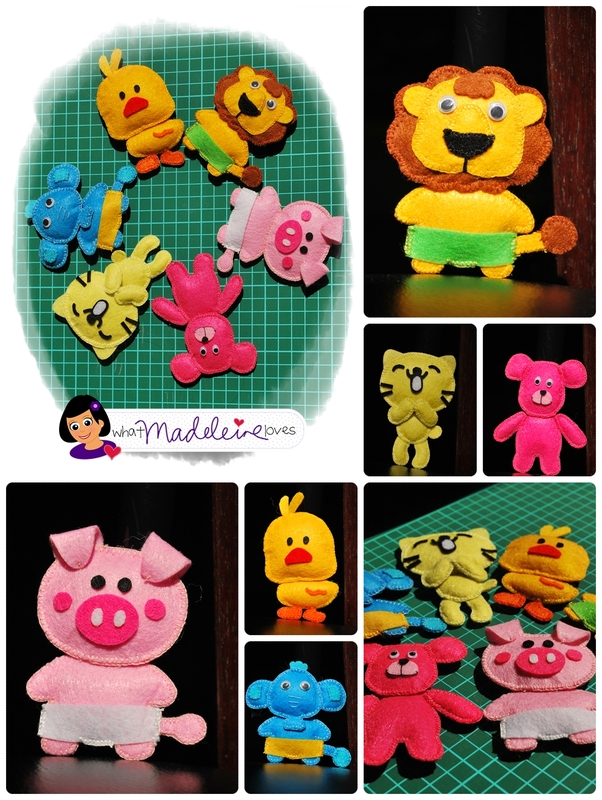 Here are my Felt Animal cuties --- my first ever felt project! And I am sharing you the pattern of the 6 animal cuties --- download it HERE. Hope to see your cuties!!! These are so adorable! Thank you very much for sharing them!